Most people across the world know the Mars Bar (see picture above). It was “invented” in 1932, in the town of Slough, England, by an American called Forrester Mars. Since then it has become one of the most popular snack bars or sweets (or candy bars as the Americans call them) in the world. People in Scotland are famous for having a “sweet tooth” (this means we like sweet, sugary foods) so Mars Bars are very popular here. However, in 1995, a fish and chip* shop in Stonehaven, in north-east Scotland, decided to deep-fry Mars Bars and sell them to customers. This means coating the Mars Bar in batter (a mixture of flour, eggs and milk) and then frying them under very hot fat or oil (see picture below). 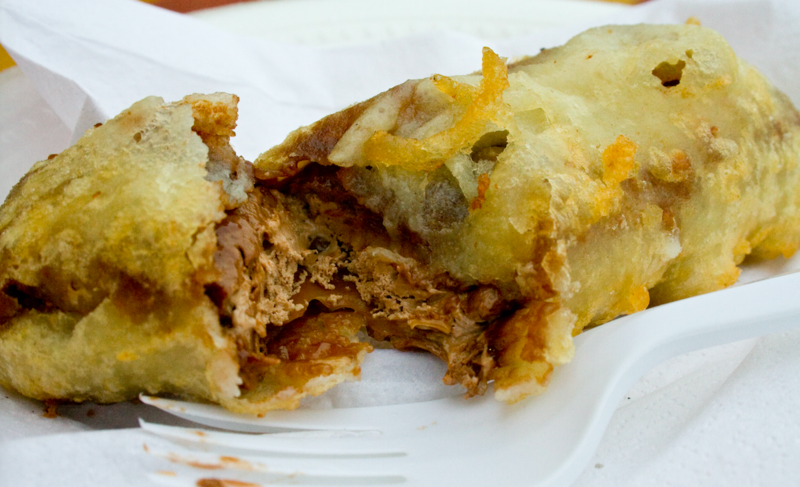 Although these Deep Fried Mars Bars attracted a lot of publicity in local newspapers they never really became very popular until they began to attract the attention of big newspapers and TV stations. The combination of sugar, chocolate and deep-frying means that they are VERY unhealthy (and very sweet and sticky). You can get them at a number of fish and chip shops, especially in Edinburgh, and while we wouldn’t actually recommend them, one probably will not do you too much harm. However, depending on your religion, be aware that some fish and chip shops use beef fat to deep-fry their products. * If you haven’t had fish and chips, most of our students all love them!